JACKSON, Tenn. — Lane College is looking to empower its students and community members. 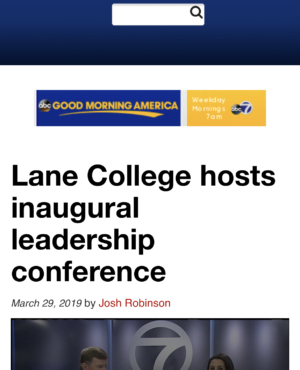 “We are really committed to being an anchor in Jackson, Tennessee, especially in the community we are rooted in,” Michelle Stewart, Vice President of Academic Affairs at Lane College, said. Friday was the first day of the inaugural leadership conference. “The purpose of this conference is really to build up east Jackson,” Stewart said. Friday morning, Lane College graduate John Odom was back on campus to speak about his time at the school. Odom was at Lane College during the riots after Dr. Martin Luther King Jr. was assassinated in Memphis. Friday afternoon, students and community members could attend workshops on empowerment. To end the night, keynote speaker L. Michelle Smith and Lane College President, Logan Hampton, spoke on the topic building your brand. The conference will continue Saturday. Actor Daryl Bell will be speaking on communication strategies to build a new world. You can register for Saturday’s event by going to the gym on Lane’s campus starting at 9 am.